Size Does Not Matter When We Bring to You Gorgeous Halloween Outfits! Being party ready is one everybody's mind especially with approaching holiday season. 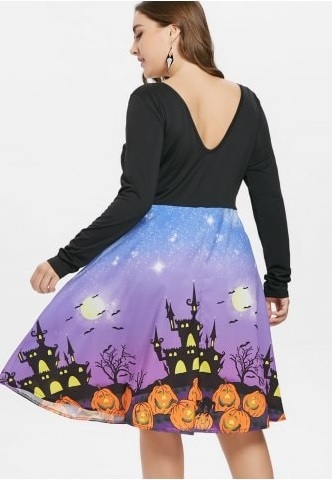 Before that, welcome Halloween in style and buy this fantastic scoop neck dress that is totally in sync with the Halloween theme. The Pumpkins on the hem and the dark castle with enigmatic lights and bats and moon, simply needs to explanation about the reason. Why this outfit has been designed. The black upper body and the well coordinated mauve color otherwise makes the dress very attractive. Sway in this scoop neck and be a part of the Halloween Party while you allure others in this gorgeous outfit. While you celebrate Halloween with pumpkin carvings and other dedication of costumes and make ups, get something to repel the evils and the demons. 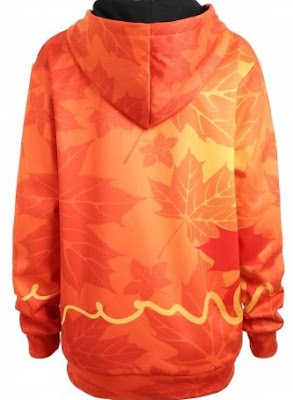 Buy this amazing maple leaf printed hooded jacket to shun away the evil spirits and make merry. The orange color of this lovely hooded is tailor made for those who like to celebrate everything in style and brightly. The front of this jacket has a pumpkin printed that signifies the celebration of Halloween, so carve the pumpkins while you are dressed in this brightly hued hooded outfit that you may buy this from Rosegal or other E-commerce websites that have such a collection. Bats are nocturnal creatures representing the depth of dark and other things that represent darkness. So night is the best time to celebrate Halloween and when you are dressed aptly in an outfit that signifies the celebration, you feel confident and take part in every activity with enthusiasm. Graphics are the in thing and when during the Halloween you get a skull graphic tee which is very stylish. The Off Shoulder black neck of this sky-blue top magnifies the neck bones making your body look thin. You will look very stylish in this off-beat color when you pair this up with black denims or a casual lowers and sneakers to add to the sporty look. 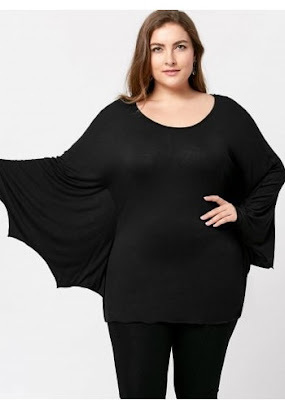 The hem and the off-shoulder neck are in thick black strip giving body to this top. The mesh on the edge of the sleeves of this top makes it a girly top. So, wait no more and buy this skull printed top with heart shaped eyes that will beat back the demons. We weave our lives just like the spider weaves its web. So common on this Halloween and weave some happiness in your lives. 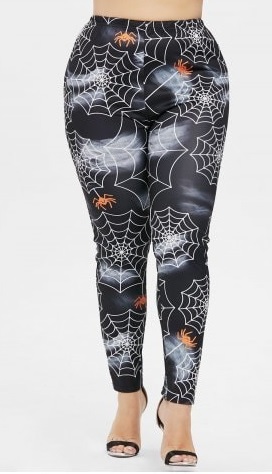 With this lowers with web print all over will continue to inspire you along with the brightly hued spider that shows how you can relentlessly work hard to weave a lovely life towards this coming new year. So be the harbinger of your own prosperity with this amazingly printed webbed pants that you can pair with heels or flats with a blingy top or a casual tee, choosing your occasion and the event. Be ready on this Halloween to shun the negatives and attract the positivity.